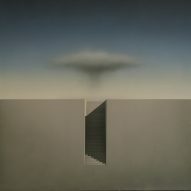 Monolithic volumes against gradated backgrounds and staircases that lead to nowhere are depicted in the architectural paintings of Iranian artist Mehdi Ghadyanloo, which are set to go on show in London next month. Ghadyanloo's solo Spaces of Hope exhibition is organised by Shoreditch-based Howard Griffin Gallery, and will take place at the Ambika P3 space in Marylebone from 2 March 2017. The artist's work is heavily influenced by the architecture of 20th-century modernists like Le Corbusier and their utopian visions, as well as elements of surrealism. Ghadyanloo evokes dramatic three-dimensional spaces using acrylic paint on canvases, ranging from around 1.5 metres to 4 metres in width. In many of his paintings, architectural volumes are placed in abstract landscapes or against coloured backgrounds. 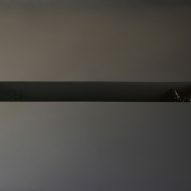 Others feature more detail, including the doglegged staircases suspended within three vertical voids – but which lead nowhere – in his Early Redemption painting. 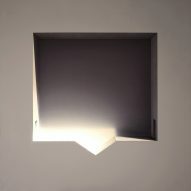 Shadows and light on the surfaces depicted in the artworks contribute to the architectural feeling. 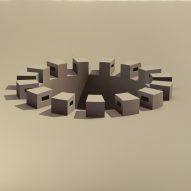 Some of the images feature groups of people, adding a sense of scale to the geometric masses portrayed, while others are uninhabited for the viewer to interpret the size of the spaces themselves. Ghadyanloo is based in Iran, which has a strong history of modernist architecture seen a significant boom in contemporary buildings in recent years. He has painted over 100 giant murals across his home city of Tehran between 2004 and 2011, and recently worked at a similar scale across the full side of a building in Boston. The London exhibition will include works completed over the past year. It is curated by gallerist Richard Howard-Griffin, who previously put on a show of graffiti fantasy creatures by street artist Phlegm at his east London venue. "I am independent person trying to push the limits of what can be done with a big exhibition and do some break out big shows, with new artists like Mehdi," Howard-Griffin told Dezeen. He said that it is increasingly hard for independent gallerists like himself to put on exhibitions of this scale. Rent at his space on Shoreditch High Street has doubled in 2017, and expansion overseas has also proved challenging. "Pushing the boundaries with big shows in places like London is becoming harder and harder for independent galleries," he said. 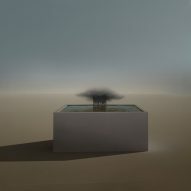 "But these sort of projects are what it is all about and great artists like Mehdi Ghadyanloo make it worth the risk." 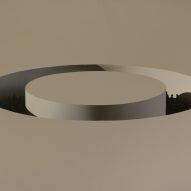 Architectural artworks have been the subject of a variety of recent exhibitions worldwide. 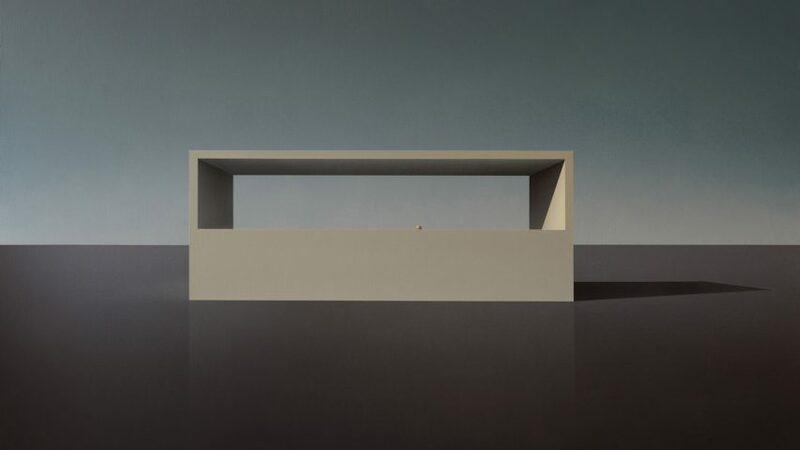 A show of early paintings and drawings by late architect Zaha Hadid took place at the Serpentine Sackler Gallery in London, while model photos by James Casebere that recreate Luis Barragán's "emotional architecture" are currently on display at Sean Kelly Gallery in New York.